The Weather Guy: Rain Chances?? Possible rain chances for our Thursday weather. The great news is we clear out for Friday through the weekend. Temperatures will be 'seasonal'..that is, average for this time of year. 1996-Nashville receives 8.7" of snow! 2003-Heavy snow across the south and east slow housing starts by the largest amount in 9 years. Any of you who know me, know I love Mt. Washington, NH. It is home to the world's worst weather and is our fun weather site of the day! Check out the Mt. Washington website today! 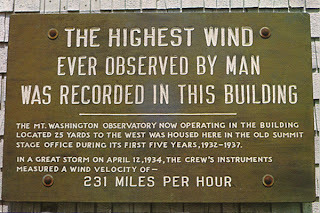 Weather monitoring has gone on there continuously since 1932.